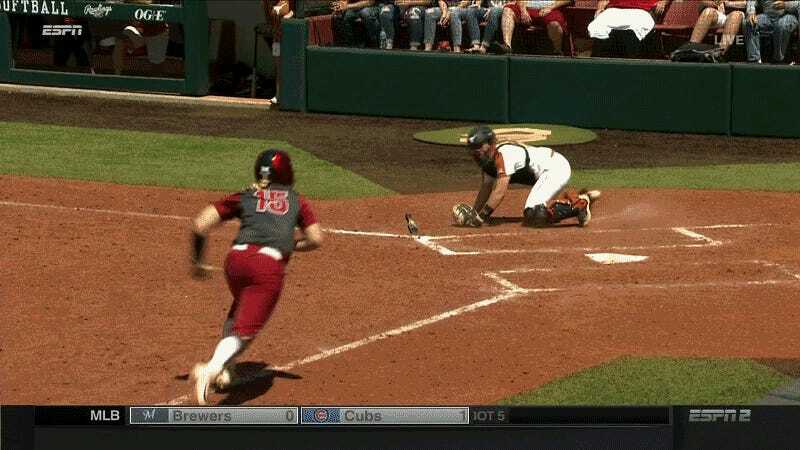 The third-ranked Oklahoma softball team beat the Texas Longhorns by a score of 7-1 today. The win featured a grand slam, but the highlight of the game is this here example of extremely creative base-running, by senior catcher Lea Wodach, who scored the go-ahead run in extremely unconventional fashion in the bottom of the fifth inning. I’m not exactly clear on how that’s not running out of the base path, but, at any rate, that’s quite the excruciating sequence for a Texas team that committed three errors in the game. How do you miss that tag?? ?